... In the era of high technologies and computer science, wood-burning masonry stoves remain one of the most efficient and environmentally friendly heating systems. Applications for masonry stoves are virtually unlimited, advantages are countless. Can you compare pleasant warmth of radiant heat with dusty blows of a central air system? Can you compare taste of bread or pizza, freshly baked in a wood-burning oven, with a mass product made in ordinary electric stove? Different names were given to masonry stoves in different regions of the world, but the names always reflected importance of stoves in people's life. 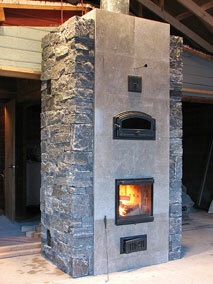 In Finland, masonry stoves are called "heart of the home"; in Russia - "soul of the home". Highest efficiency that can be achieved burning wood. Efficiency of masonry heaters of the best design falls within the range of 65 to 85%. This is considerably higher than efficiency of standard metal stoves and fireplaces. Almost no wood smoke emissions. High safety. Properly constructed masonry stoves don't produce creosote. Possibility of poisoning by CO is almost eliminated by stoves' design and by elimination of necessity to burn wood constantly. Minimal fuel consumption. One or two fuel loads a day are sufficient to keep the heated area at comfortable temperatures throughout the day. It is possible to heat the whole house with only 3 bush cords of firewood a season. Low heating costs. Considering current prices for natural gas, propane and electricity, wood is by far the cheapest fuel available in Canada. Heating your home with wood gives you peace of mind and independence from predicted future energy crisis. Independence from "black-outs". With a masonry heater, no electricity is needed to keep the house warm. Excellent suitability for houses with solar passive design. Possibility for the stove to be faced with different materials to suit any house's concept and personal preferences.